The sea is calmer now – but still not calm enough for the fishermen to take us out for a boat ride along the spectacular rocky coast of Goishi Kaigan on the Sanriku Coast of Iwate. Back to its normal ebb and flow now, but one look at it brings back the cataclysmic nightmare of March 11, 2011 when the coastal towns of Tohoku were turned upside down and totally destroyed. But not forever.! 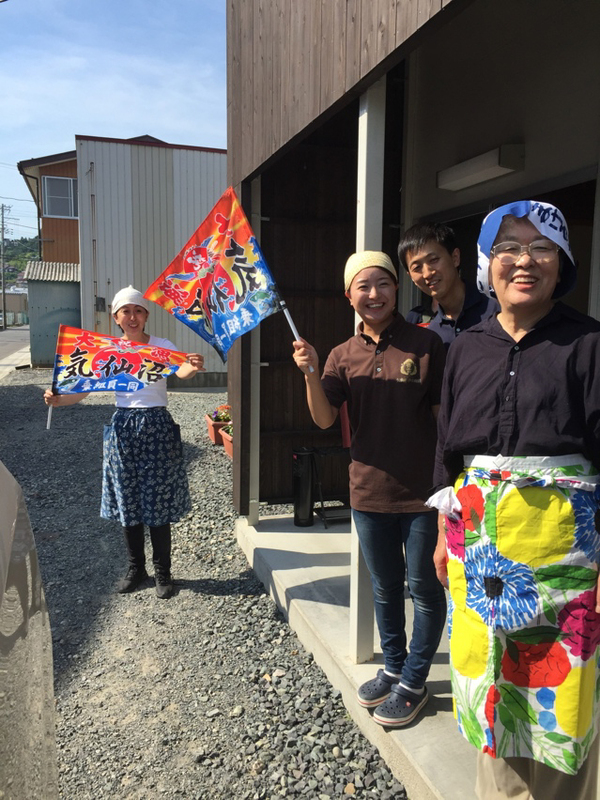 The Spirit of Tohoku has reasserted itself, and people have gotten back on their feet, picked up the pieces, cleaned them off, and gotten back to business. Quite a bit of blue & white business. With the experienced planning of two financial expert friends, we visited a number of towns that had been hard hit in Miyagi and Iwate. Minami Sanriku where a Silver Center had just been completed with the help of Planet Finance, formerly run by our leader Kazuo Tanaka who has visited Minami Sanriku countless times since the disaster to find out how to make the most difference in supporting small business recovery. He screened numbers of people to find small pop-up restaurants to support, silver centers needing financing for new buildings, food production companies. On a brilliant blue Saturday afternoon, Hideko Oikawa greeted us humbly, repeatedly thanking us for having come such a long distance. 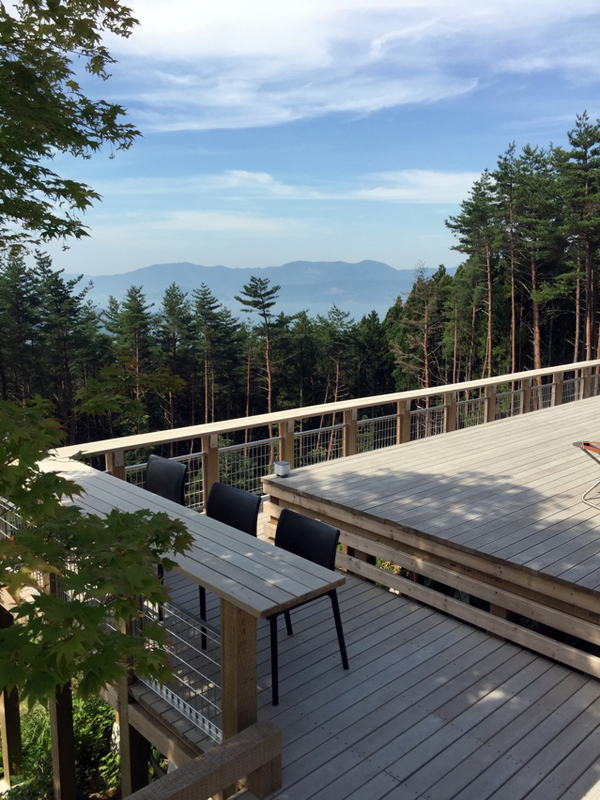 Her Oikawa Denim Company, set on top of a steep hill commanded a spectacular view of the houses below and the peaceful bay beyond ringed with poplars and a tall keyaki tree. The entrance was spacious and well appointed. The guest room where we sat was decorated with lace doilies on the table, pictures on the wall, and a corner filled with Zero jeans, her company’s own brand, as well as other products made by Oikawa Denim. The view in front of us was so stunning that you could hardly keep your eyes off of it. But then her chilling tale flooded out in a torrent of images of the earthquake and its aftermath. 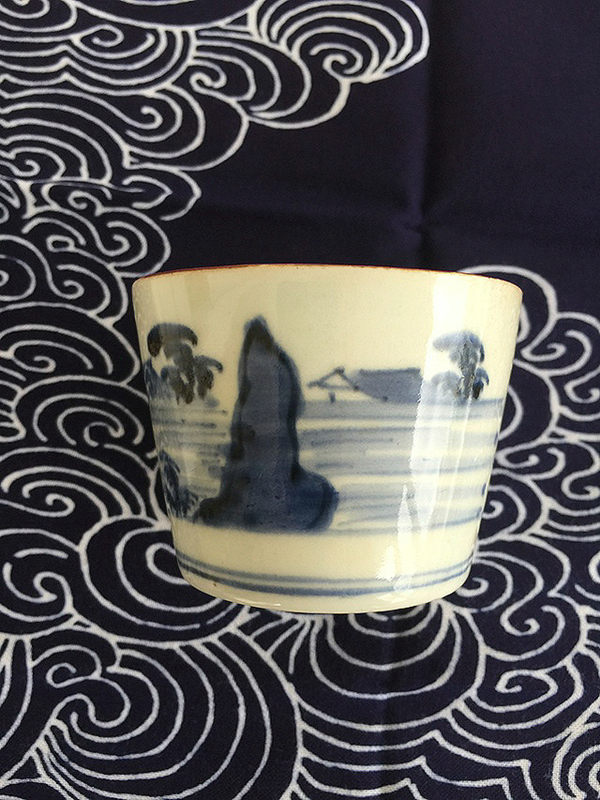 Like this blue and white imari soba cup we were given later by Masatoshi Shishido of MAST, a canvas bag maker also in Kesennuma, – which will exhibit its bags at Blue & White from September 5th to the 15th – 18 meter walls of water rushed onto the shore and swallowed houses and warehouses and everything in its path. Mrs. Oikawa showed a series of laminated photos to illustrate the progress and impact of the tsunami that followed the 9.0 earthquake that shook Iwate, Miyagi and nearby Fukushima. The tsunami was the. It ripped through the towns we visited and flattened them, rearranging them in macabre ways leaving huge fishing boats up ended in the middle of towns and railroads bent and twisted in amusement park contortions. It left families searching for days, mourning for their lost. Oikawa san told her tale of how people had fled in terror to her factory on higher ground and together 150 people spent the next week watching in horror and huddling together for warmth and courage , sleeping on the ground covered with cardboard and denim. Miraculously 2 7/11 delivery trucks had been stranded near her company and so the 150 people shared Conbeni onigiri (rice balls) and bottles of water, cans of juice. In time they ventured down the hill to inspect the damage. Miraculously none of the Oikawas’ 20 employees lost any members of their family, though houses were lost and ruined, so they pluckily returned to work as soon as water and electricity were restored. Now, 4 1/2 years later, we are chilled by their story, ad and impressed by their determination to make the most of what they are given. Using the fibers of sword fish tusks to strengthen their jeans, seaweed from the sea perhaps. 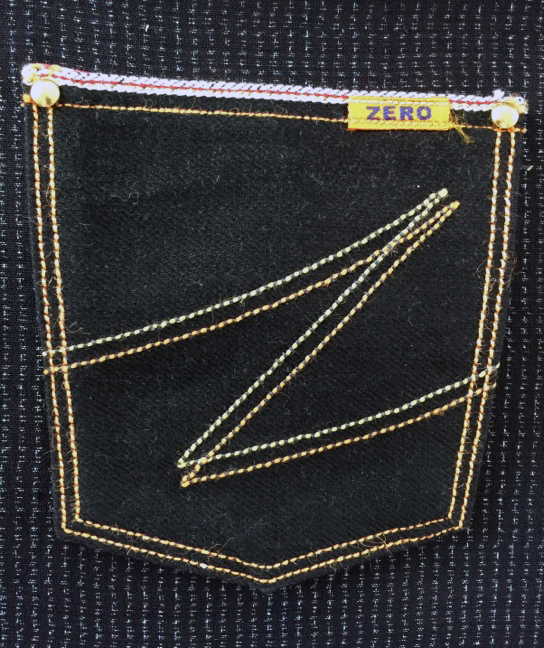 Today 15 employees have stayed working late on a Saturday afternoon to show us how they make Zero jeans, as well as other jeans for other well known brands. The meticulous piles of watch pocket patches, and left legs and right legs, belts and loops, are the picture of system and organization. The key ingredient lavished on the production is the care and energy and the skilled craftsmanship that the hands of Tohoku are so famous for is palpable here. We order 3 pairs of Zero Jeans. At Mast, a former sale making company that converted to making canvas bags after the Tsunami, we examine their wide selection of bags and order for ourselves and for Blue & White. 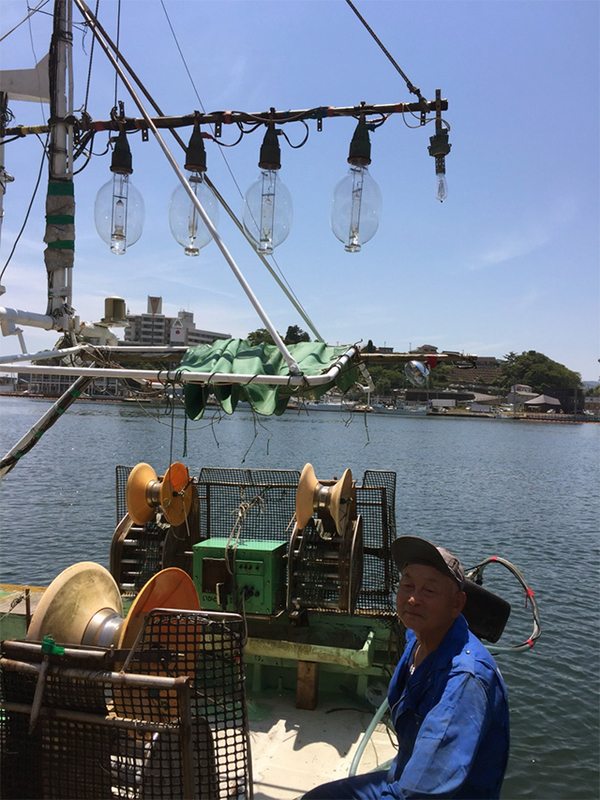 Also in Kesennuma, a squid fisherman waits to set out to sea. 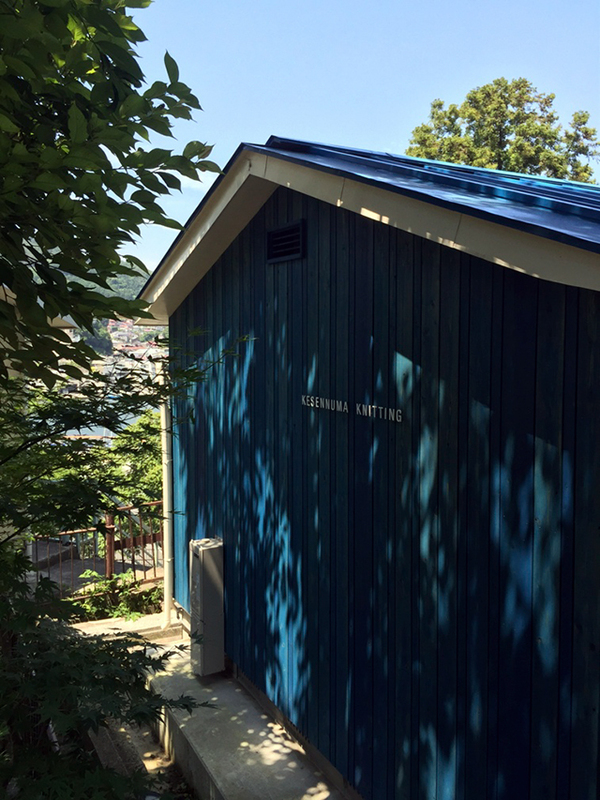 At the top of a hill overlooking Kesennuma is a simple blue house that is the workshop of Kesennuma Knitting, a beautiful enterprise teaching the dextrous women of Tohoku how to knit classic patterned woolen sweaters in a few basic patterns. The building is purity itself, and the sweaters are irresistible. Our guide was Kazuo Tanaka who has been visiting Tohoku regularly since the Earthquake and Tsunami and finding companies to support with his Planet Finance micro financing small enterprises that need support. He studied their needs carefully and wisely chose those whose character was most outstanding and ambitions most worth. A shopping center and restaurant complex in Minami Sanriku, a ramp for the Senior Center. Even our masterful guide and organizer could not resist. 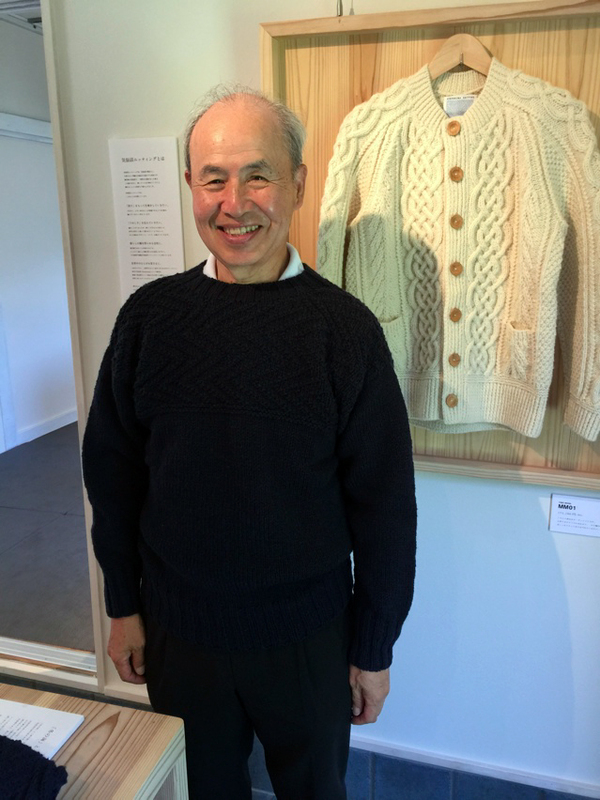 Kazuo Tanaka is a perfect model and proud new owner of a Kesennuma hand knit sweater in classic navy blue. At BAPPA No DAIDOKORO we met the indomitable Saito family who run a food supplying company and an unforgettable Granny’s Kitchen where food was delicious, fresh and from the heart. The whole family joined in with gusto. 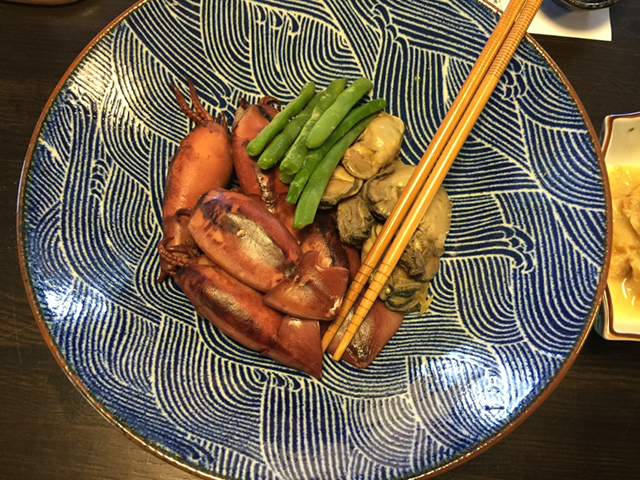 The blue and white daughter travels all over Japan explaining about food and Tohoku and her family. 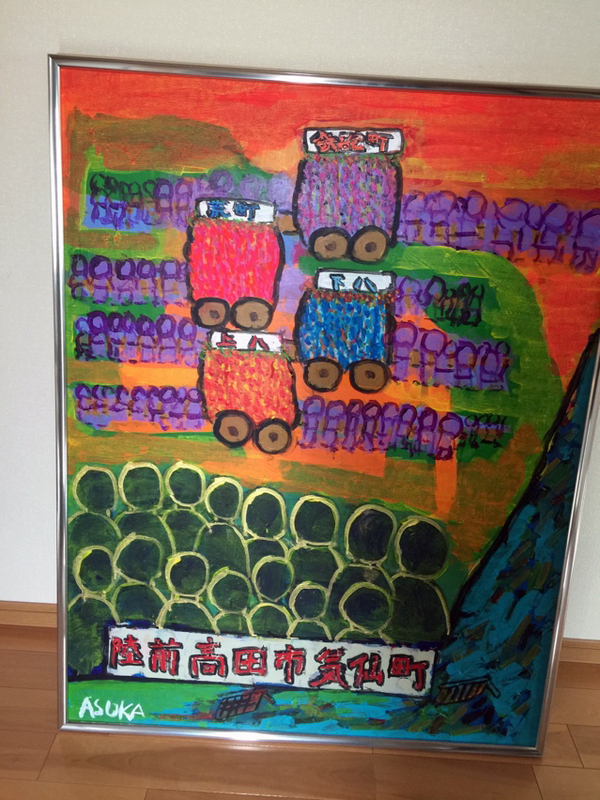 Imagine our surprise when the first sight that greeted us was a huge white square wall that turned out to be a refrigerator storage container that had been donated by DENSO whose name was written below a round red Japanese flag. Our third member George Olcott just happened to be on the Board of Directors of Denso and was quick to report back to the company, that Denso’s quick generosity had saved the Saito family’s business. There was gladness all around! 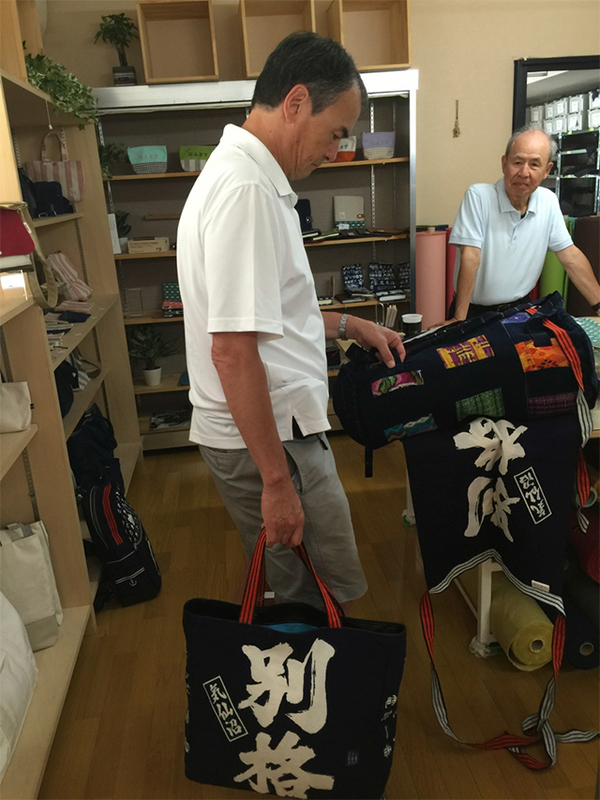 The people we met in Tohoku were courageous and generous. 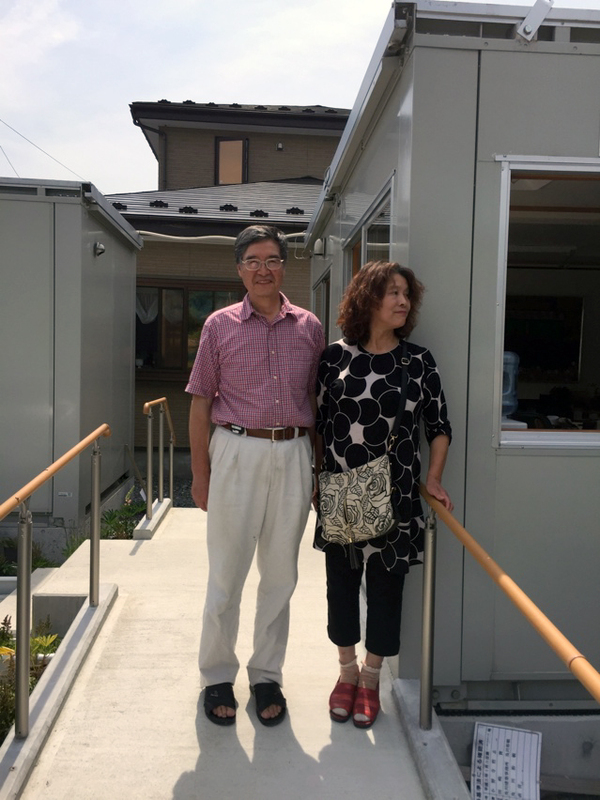 Mrs. Sasaki of Ofunato was quick to thank George Olcott who had come with his family 4 1/2 years ago to help clean out the sludge and debris of the tsunami. 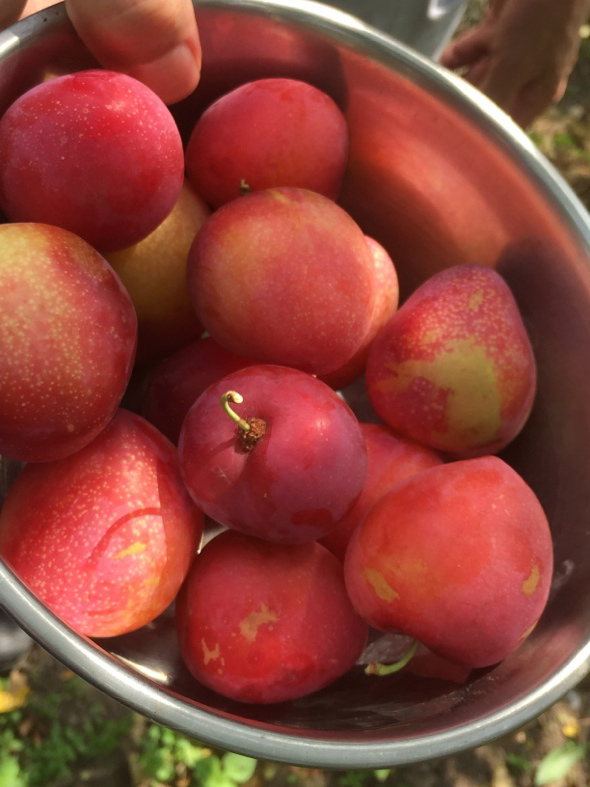 She thanked him with her late evening’s production of Suu momo/apricot jam, and juice. 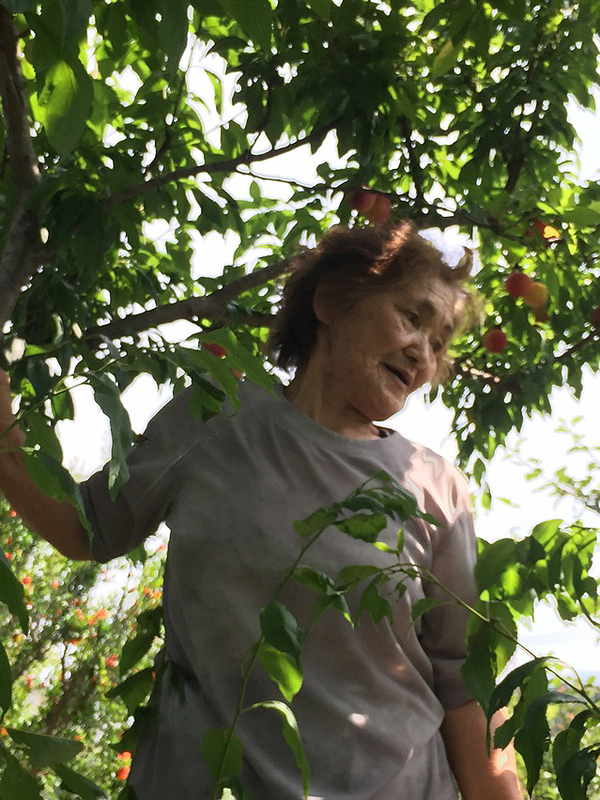 At 86 plus, her agility in climbing a tree to give us more fruit was impressive – and delicious. No tree to high for her. The fruits of her labors. 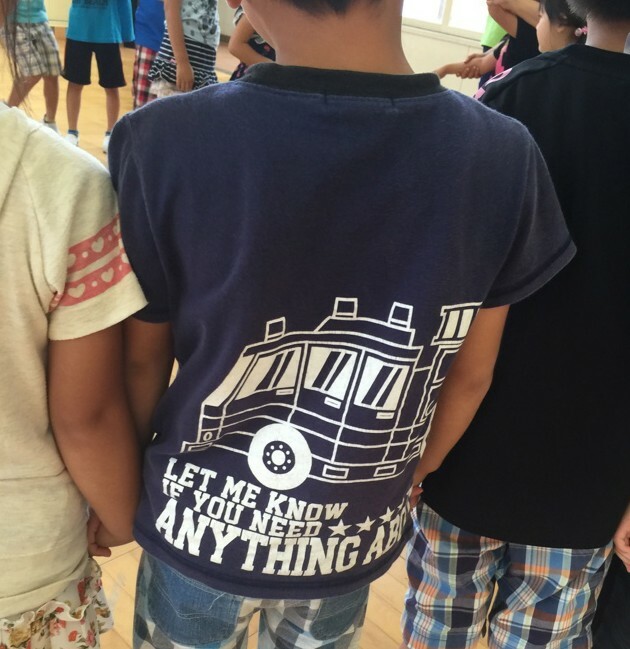 Amya Miller, a huge hearted, bilingual American woman, not only teaches English to preschool children who forget all their concerns with a hot game of DUCK! DUCK! GOOSE! and welcomed us with shouts of delight. Instant communication, instant trust that Amya has been building up in the 4 years she has been commuting to Rikuzen Takata, are clear in the bright faces of the children. They greet us spontaneously and are fearless in using their English. At the same time she serves as the Director of Global Public Relations to the city of Rikuzen Takata in Iwate. 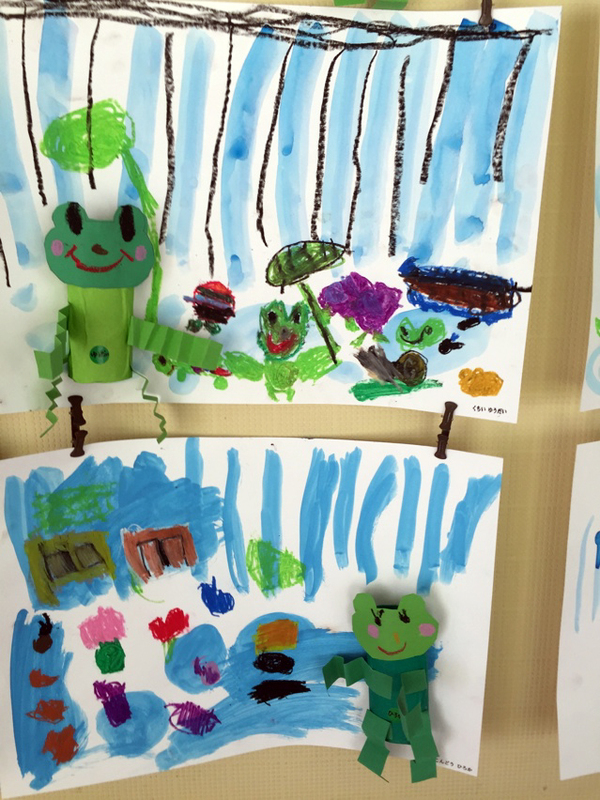 Bright rainy season paintings at the pre school where Amya Miller teaches. A CBS TV crew had just spent 2 days filming Amya in all her daily activities. No wonder! She is a gift to Rikuzen Takata. 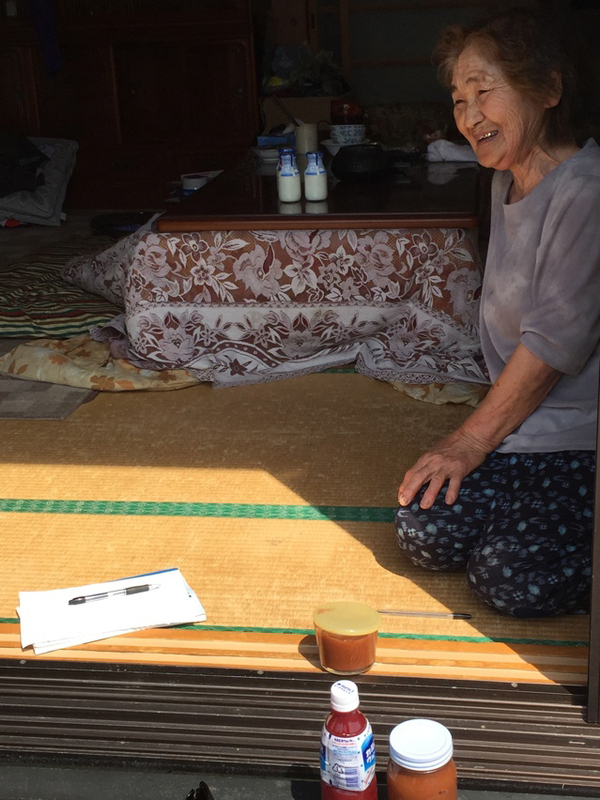 Though we didn’t get to meet Asuka Tazaki, we sat in the family dining room in a temporary prefab structure and enjoyed the morning’s bread baked by his baker Mother. Asuka is in his 30’s and autistic. 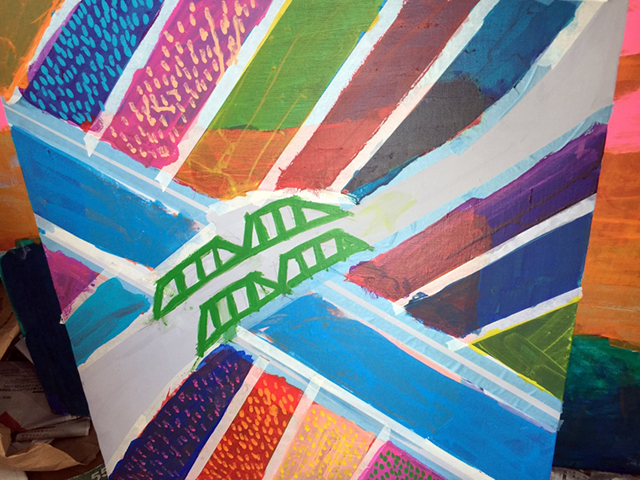 His paintings are intense and vibrant and express some of the shock and grief that he and his family have encountered. His powerful paintings are deeply moving and eloquently articulated. 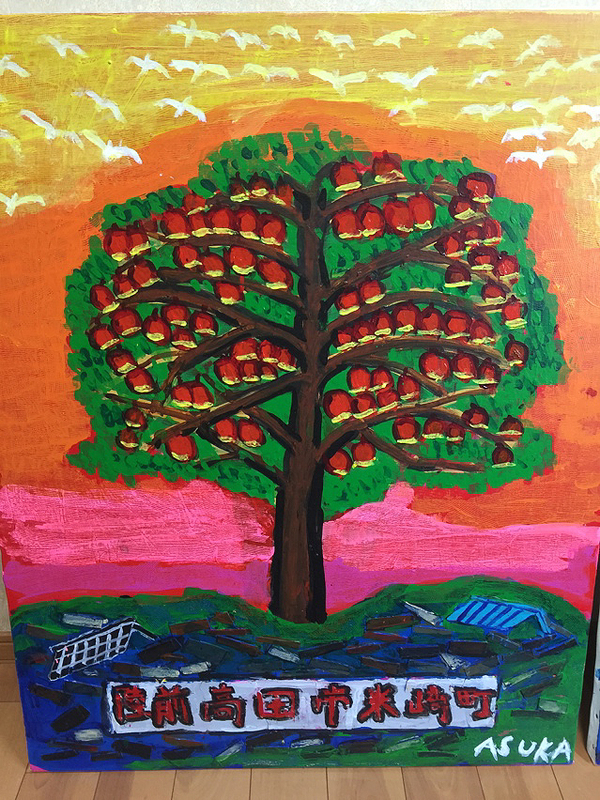 While also running a best selling bakery, Mr and Mrs. Tazaki devote themselves to encouraging and exhibiting Asuka’s powerful art and other community projects. 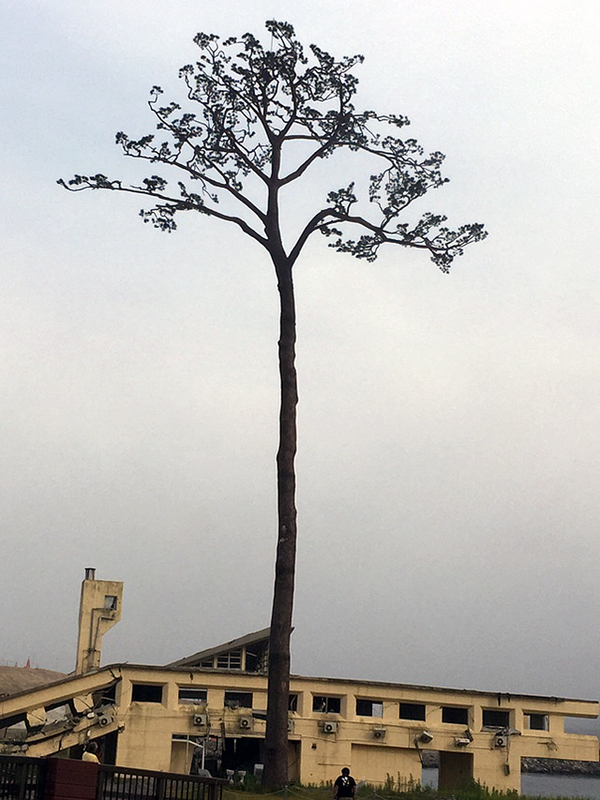 One brave, although now reconstituted, pine tree remains of the stands of pines that grew by the river before the earthquake, It symbolizes the courage of the people of Tohoku who won’t give up. The Spirit of Tohoku. From all over Japan and other countries as well, people come to make a pilgrimage here. 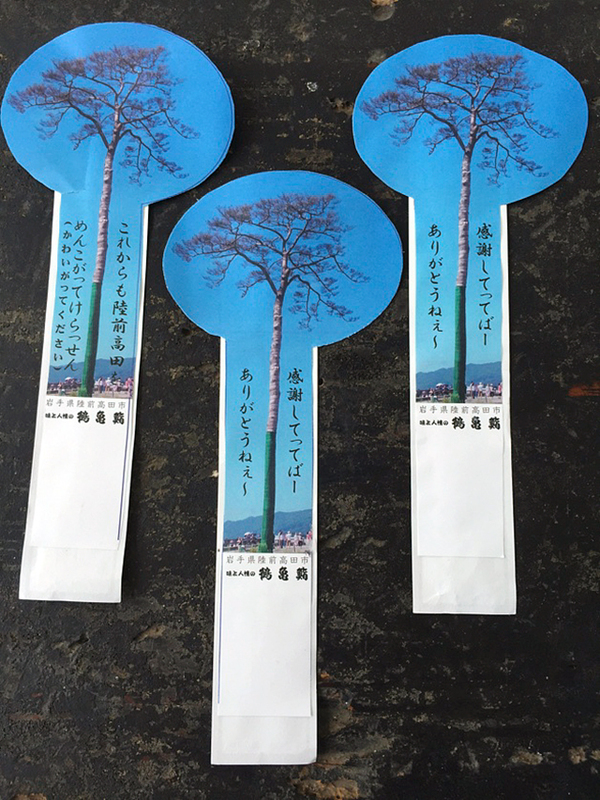 It symbolizes the Hope of Tohoku – The Hope of Japan to recover from disaster, to rebuild and become strong again. As one of our members remarked, it could be that from this adversity may spring new hope and new energy to lead the way and show for the rest of Japan to prosper and grow. That is the power of Tohoku. 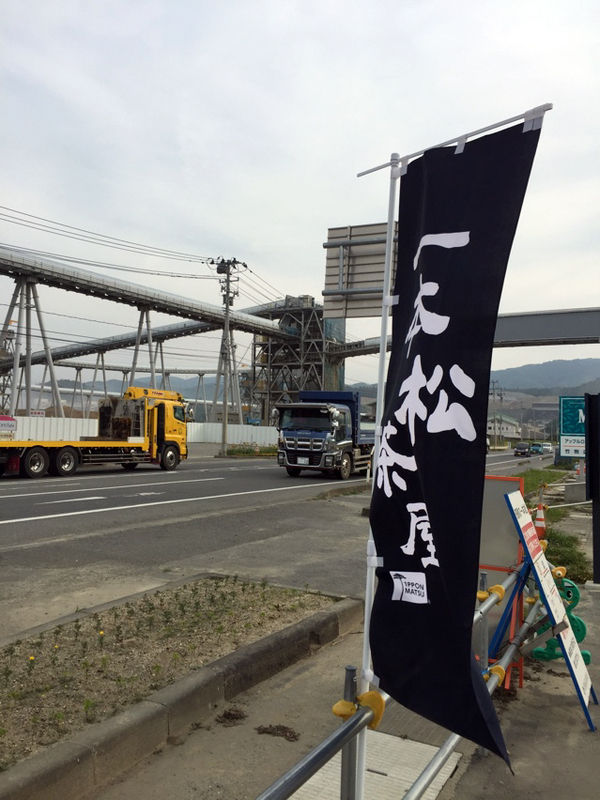 A banner for soy sauce based ice cream flaps while trucks and conduit pipes move mountains from one side of the river to the other to build walls against future tsunami destruction. 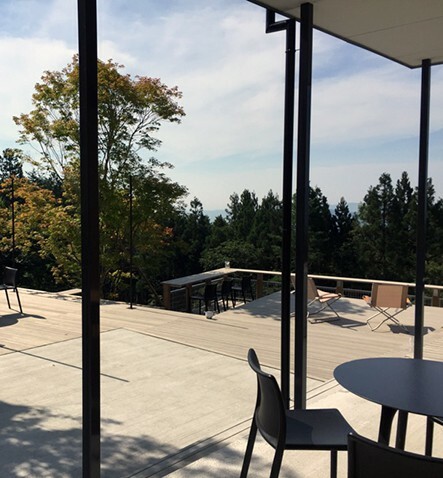 The pure and simple Hakone Yama terrace is surely one of the most serene and beautiful hotels I have ever stayed in Japan and elsewhere. A hopeful sign of new beginnings in Rikuzen Takata. 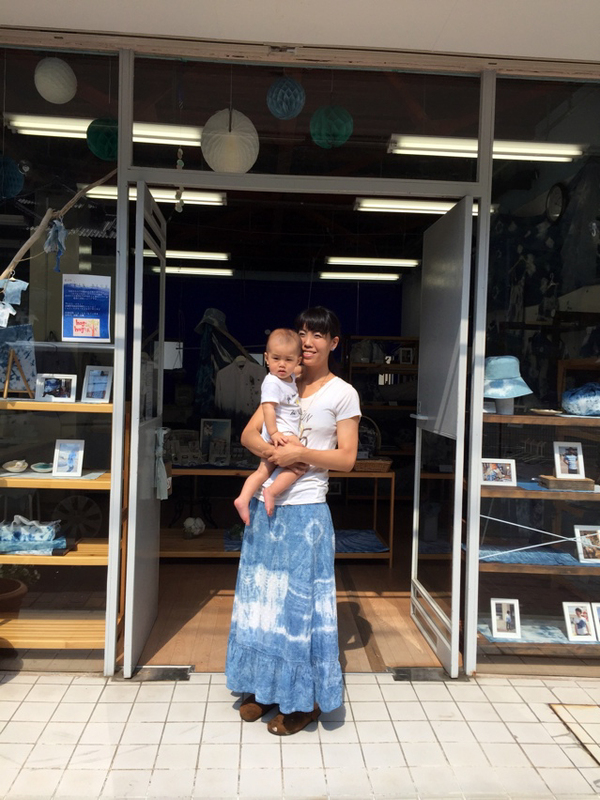 Ocean Blue is a Community Creche started by Sayaka Fujimura in the spring of 2015, for her family with the intent of providing a place where young Mums can come and bring their children and share their lives, while learning the art of indigo dyeing in a warm environment. It is a gentle open place that not only dyes beautiful baby goods but also stoles and shirts for adults. We nearly bought out the shop and already the indigo clothing is selling quickly at Blue & White. What a beautiful success story born of hard work and dedication. 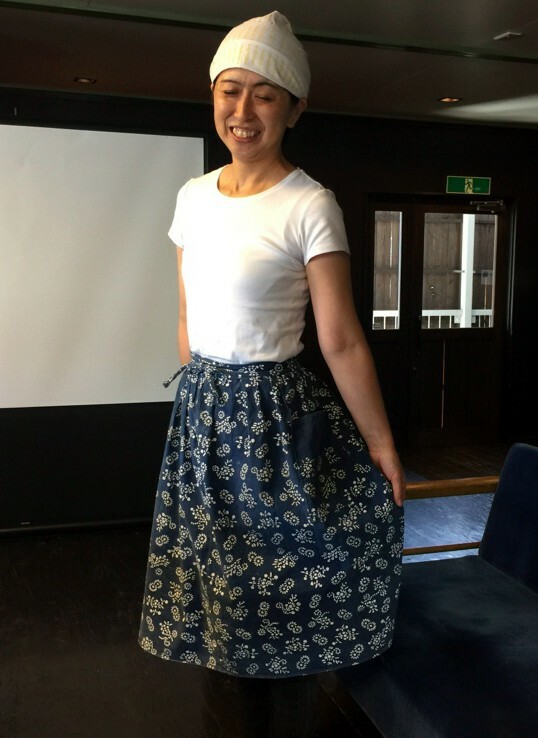 Not by chance, we happened to sit next to Sayaka in the beautiful fish restaurant in Kesennuma, the evening before Amya had kindly made an appointment for us to meet her the next day.The Indigo Thread connects us all! 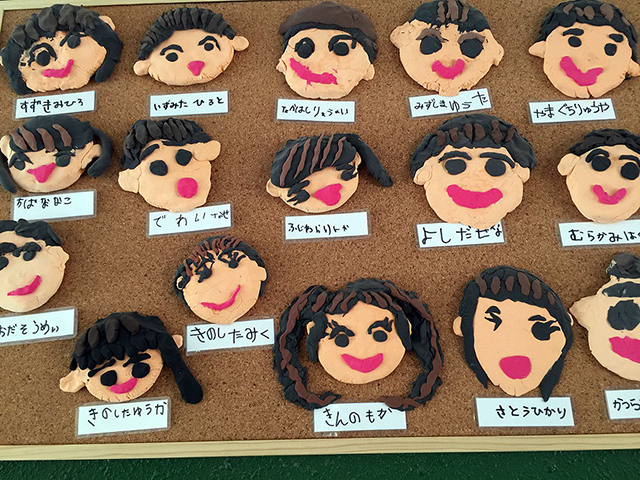 All hail to Tohoku and their Gutsy People. We shall return and continue to show the world the good things you are doing, the good things you are making! using this uplifting travelogue …. The sweaters from the knitting workshop are reminiscent of the sweaters made in the Aran Islands in Ireland. I want one of those canvas bags, they look amazing! 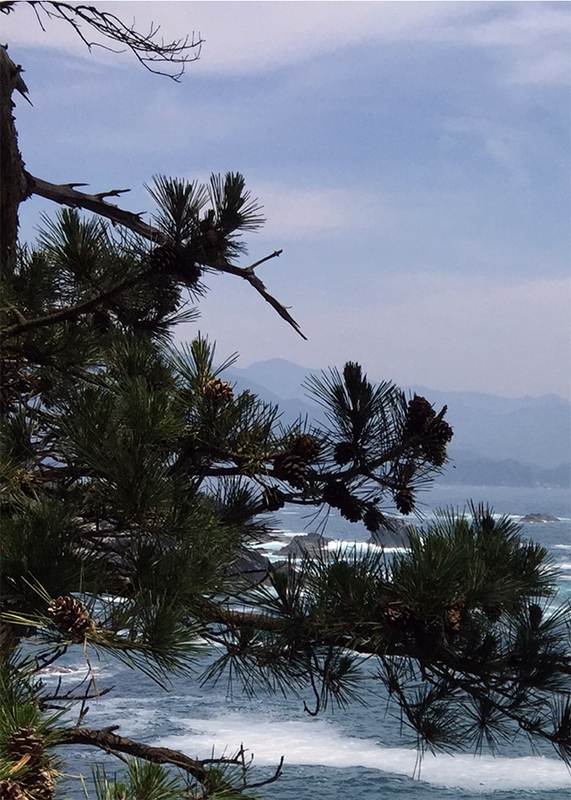 The scenery is breathtaking, thank you for bringing this beautiful part of Japan to our attention.